Opponents to the project had long argued it could jeopardize the pristine environment of U.S. biggest salmon fishery. After five years of debate giant miner Anglo American (LON: AAL) said Monday it is pulling out of its polemic Pebble Mine project in the Bristol Bay region of Alaska, adding it will pay a $300-million "impairment charge" to its partner Northern Dynasty Minerals (TSX: NDM). 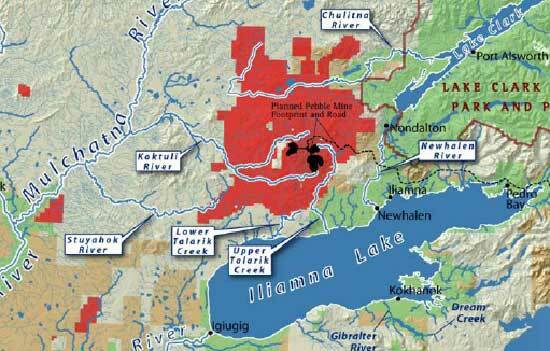 “Despite our belief that Pebble is a deposit of rare magnitude and quality, we have taken the decision to withdraw following a thorough assessment of Anglo American’s extensive pipeline of long-dated project options," said CEO Mark Cutifani. Since taking over from former head Cynthia Carroll in April, Cutifani has vowed to cut costs and boost Anglo's profitability. According to today's statement, dropping out of Pebble seems to have been just was one of the executive's latest efforts to improve the company's performance. "Our focus has been to prioritize capital to projects with the highest value and lowest risks within our portfolio, and reduce the capital required to sustain such projects during the pre-approval phases of development as part of a more effective, value-driven capital allocation model," he said in the press release. The Pebble deposit, which could be worth as much as half a trillion dollars, hosts 55 billion pounds of copper, 76 million ounces of gold, 3.3 billion pounds of molybdenum, and quantities of silver, palladium and rhenium. Pebble mine would have become the largest open pit copper and gold mine in the world, but it would have generated tons of potentially dangerous waste material, which would damage the area’s salmon population, one of the world's most valuable habitats for the fish. In May, actor and activist Robert Redford wrote in the Los Angeles Times that the area was "just too important, environmentally and economically, to be sacrificed for the sake of foreign mining profits." A month later five Democratic senators formally asked President Barack Obama to consider blocking the project, as it was seen once as the most important environmental decisions Obama would have had to deal in his second term agenda. With Anglo's withdrawal, ownership of the project now reverts entirely to the other 50% owner, Northern Dynasty, which said it plans to go ahead with the mine. 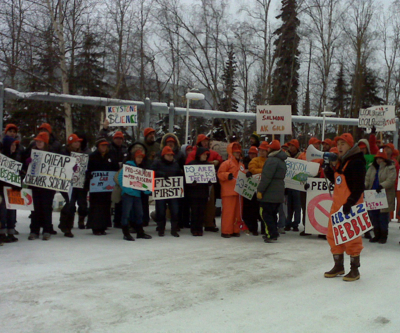 Image of protestors from Stop Pebble Mine.